I chose to move to Mexico rather than go travelling because I wanted to experience a country intimately; I really wanted to know its people, explore its places, and discover its secrets. And so nothing gives me greater pleasure than the opportunity to head a little off the beaten track and go somewhere that’s not in the guide books. Being a girl from a small English seaside town, I’ve had difficulty adapting to life in a big inland city, and I jump at the chance for a trip into the wilds – bikini and hot springs sounded perfect. As the saying goes: be careful what you wish for. I wanted an adventure in the wilds and I sure got one. I had heard of Tolantongo and seen some photos from people who had been. “You have to go,” people told me, “it’s incredible,” they said. “You might want to take a raincoat,” however, they did not. The state of Hidalgo lies in central eastern Mexico and boasts strikingly rugged terrain. It touches on the south of the Sierra Madre Oriental mountain range and is home to five major canyons, one of which is called Tolantongo. Located in the Mezquital Valley, the resort of Tolantongo (and the river – you guessed it – also called Tolantongo) is 17km from the town of Ixmiquilpan. The approach is breathtaking: a number of transport changes are required with the mode of wheels becoming smaller each time. The resort is fairly remote – just as it should be when you’re on the hunt for a really good adventure/nightmare. We arrived at the site to be wowed by the picture perfect vista. There are a number of pools staggered down the cliff face, with the most wonderful sight of the canyon with its walls up to 500 metres high. The water comes directly from within the mountains, making it lovely and warm. However, there is one rule and guards to enforce it: no alimentos – no food or drink. Well this poses something of a problem for group of eighty twenty-somethings: first of all, it’s a rule, which generally doesn’t go down too well in Mexico. Secondly, if there is one rule, it’s that you just don’t relax in Mexico without a chela – a cold beer – in hand. So after a little while we moved off from the pools down to the river on the canyon floor – with chelas aplenty. The river was beautifully warm too, and by wedging yourself up against a big rock you could have yourself a cracking homemade jacuzzi. So far, so good. After some delicious Mexican grub (chilaquiles, alambre, quesadillas) we moved off again to explore the area of the canyon called La Gloria. Here there were a series of grutas (caves) and cascadas (waterfalls) to explore. The water inside the caves is hot, but the water plunging from the waterfalls is cold, which make for a really fun dash-and-stop course of proceedings. As you venture deeper into the caves they become harder to navigate, and in the final ones you are in pitch black (apart from a couple of guides flashing torches), scrambling along in single file clinging on to a rope attached to the inner wall, sometimes heaving yourself up to climb over an obstacle and at others letting go to slide down a smooth rock, plummeting down to where your feet can find the bottom again. It was SO MUCH FUN. Unfortunately, due to not having a waterproof camera and hands being otherwise occupied I don’t have any photos of the caves, but it was like the best imaginable kind of free and natural water park. After more delicious Mexican grub (and a couple more chelas) it was time to move on to the place where we were to camp overnight, a “fifteen minute bus ride away”. Fifteen minutes turned into an hour and a half, and as we arrived at a little shack in the middle of the Mexican highlands, we were informed that a bridge had been closed and we’d been diverted on an elaborate detour. It was about 9pm at this point. Here we were to wait for local pick-up trucks driven by classic Mexican rancheros to take us down to the river-side camp. Ok, no biggie. We’re in Mexico, so we knocked back some tequila-laced coffee while we waited, naturally. After a couple of hours the pick-up trucks began to arrive and people piled on with all their stuff. Then they stopped coming, no more pick-up trucks. I was not on a pick-up truck. Ok, potentially a biggie. The round trip down to the campsite and back again was about an hour and a half, so we were advised that we may as well start walking and set off into the black of night. Of course, I take the luck of the Irish with me wherever I go, and the moment we started walking coincided perfectly with the moment it started to rain. This might not seem so extraordinary, but let me just say that hiking and wet weather were never, to my knowledge, on the agenda. I was not the only person who found myself laughably ill-equipped, and of course I felt slightly better that there were a number of people even worse prepared than I was, slipping and sliding around in their sandals whilst juggling their bags, desperate to stay upright as we wove our way down the mountainside. “What wild animals hang out in the Mexican highlands?” I wondered, and I’m sure I wasn’t the only person thinking it. Eventually, the camp appeared in sight. Marching down a dark and treacherous path toward a few twinkling lights in the distance, I felt like Bilbo Baggins, only it wasn’t some odious mythical creature we were in pursuit of but a cluster of tents amidst a raucous pool party. The fifteen minute bus ride had turned into a five hour ordeal, but by 2am we had made it, and nobody was more ready for the pachanga than we were. I will spare you the details of the party, but when I went to bed at 8.30am the music was still playing and a few jolly revellers remained in the pool. A good party, some might say. The rain had continued all night, so what had been a damp site when we arrived was now a mud pool. Absolutely everything in the tent was completely soaked through, so the best option was to go straight for breakfast and nurse our impending hangovers with huevos rancheros, pan dulce and steaming cafecito. No dry towel, no dry clothes, just sitting out in the elements getting colder and wetter. Well if you can’t get dry and warm, you may as well stay wet and warm, so we headed back into a hot pool where we able to shelter from the rain in a toasty cave for the rest of the day until it was time to return home. Ah, the return home. If the buses couldn’t get to down to the site in the rain, how were we going to get back up now that the whole place was flooded? Staying by the side of the river on the canyon floor may have seemed like a good idea at some point, but when the tail end of Tropical Storm Trudy hits and there’s a lot of water gushing down the mountain, at the bottom is not really where you want to be. Like poor little spiders washed down the plughole, there was no way we could get back up again. Now I’m not normally one to advocate Mexico’s culture of corruption, but there may be instances when, given no other option, a little bribe can work in your favour. This was one of those instances, so we paid our way to cross a forbidden area over the river (by this point I had ditched my shoes) and a short walk away we were able to get on a minibus to take us up another way to a bus collection point. Unfortunately, there was no camp fire nor 10am yoga (as the itinerary had suggested), but a tropical storm and a midnight tour of the highlands of Hidalgo thrown in for free. I couldn’t help but laugh as I plucked my suncream out of my smelly sodden bag. It should have been the worst weekend ever, but as worst weekends go it was a pretty good one. Everyone knows the best kind of adventures are spontaneous ones, and I can confirm there’s nothing that can’t be made more bearable by a good measure of tequila. When we talk of ‘marginalised groups’ we are normally thinking of minorities: those vulnerable groups in society who are outnumbered and without the necessary means to represent their interests. It’s easy to wonder how a group made up of millions of people could be marginalised – surely they could, would and should group together against the powerful few to make their voices heard? I couldn’t understand how such crippling poverty could exist alongside dramatic economic progress, until I came to Mexico and saw the jaw-dropping inequality for myself. What is easy to overlook is how tragically debilitating living in extreme poverty is. In the UK, we measure poverty in numbers: so many per cent living below a poverty line, such a number educated and so many unemployed. But we don’t see it, we don’t feel it, and we don’t understand it. When people live in real poverty (where they can’t afford to dress themselves, feed themselves, or shelter themselves adequately) they are living precariously from one day to the next. They don’t know where their next meal is coming from, how (and if) they will get their children to school, or where they might be living from one week to another. The ability and desire to plan meetings, strategies and long term campaigns to represent their interests publicly and politically is beyond comprehension. Survival itself is a full time occupation. The pressures of poverty in Mexico are closely linked to an intergenerational culture of violence, poor school attendance and ill health, with girls being likely to fare much worse. Mexico’s poor might be huge in number, but this by no means indicates the ability to mobilise themselves to defend their rights. International headlines (carefully orchestrated by Mexico’s government and media outlets – which are practically the same thing) frequently rave about the rapidly growing middle class. It is generally believed that the larger a country’s middle class, the greater its potential for economic growth and, therefore, development. This may well be the case, but the middle class also tend to be very conservative in order to protect what they have. Wealth doesn’t necessarily redistribute itself – the government needs to introduce fiscal policy to encourage it. Mexico’s middle class don’t shop in the local markets but in Walmart; neither do they drink coffee on the street corner, but in Starbucks. Walmart and Starbucks do not employ Mexico’s poorest people, and even if they wanted to, the staff probably couldn’t afford the transport to work because the stores are located in the rich areas where the poor can’t afford to live or travel to (in December 2013 the fare for Mexico City’s Metro almost doubled from 3 to 5 pesos). In 2013 Mexico’s National Institute of Statistics and Geography (INEGI) calculated that the middle class constitutes 39.2% of the population, but the lower class still accounts for 59.1%. You’d think that all the “tremendous progress” of Mexico (OECD Better Life Index) would make a little leeway for the trickle down effect: thanks to the middle class spread everybody benefits and enjoys an improved standard of living. The reality, however, is quite the opposite: Mexico’s poor arguably shoulder the burden of the successful anti-inflation drive. The minimum wage currently stands at 66 pesos per day (although it varies slightly by region), approximately £3.00. Furthermore, 6.5 million workers (13% of the workforce) in Mexico currently earn this minimum wage, which is significantly lower than the poverty line. Not only is it low and lower than the poverty line, but in real terms it’s getting even lower: accounting for inflation, the minimum wage is estimated to have decreased by 43% in the last 23 years. Added to that, a government study conducted in July 2014 found that almost 60% of the workforce is actually in the informal economy, leaving them vulnerable to exploitation and entirely without job security. In August 2014 Mexico City’s Mayor Miguel Angel Mancera proposed an increase in the minimum wage to 82.86 pesos per day (approximately £3.80), stating that low wages are “at the heart of the country’s economic and social problems.” Yet President Peña Nieto, the central bank, businessmen and pro-government unions staunchly oppose it, supposedly in fear of drastic inflation. Read alternatively, they want to protect their own interests. In its mad dash for development, Mexico has largely forgotten its poor. Social mobility is not only a product of the effort of individuals and families, but also opportunities. As De La Calle and Rubio explain in their recent book Mexico: A Middle Class Society, “Mexico has countless impediments and obstacles to social mobility.” It is the absence of equal opportunities that deny Mexico’s poor access to products and services and the ability to invest in the future. In other words, they live with very little stability and no security. What’s more, the government doesn’t just passively neglect the poor, but actively limits their opportunities. “The regulatory framework and incentives of the Mexican economy tend to create obstacles, skew opportunities in favour of very few, reduce competition, impede the development of new businesses, and limit individual potential,” they state. Mexico may be getting richer, but the poor aren’t seeing a slice of the pie. Rafael Ch, Director of Economic Development at Cidac in Mexico City, even claims that the middle class is diminishing because of its high sensitivity to macro and micro economic shocks: real income is actually decreasing. Extreme economic inequality significantly drives the abuse of power; Amnesty International and Human Rights Watch (amongst others) campaign extensively against human rights abuses in Mexico. Various types of gender, race and class inequality are inextricably linked to and exacerbated by economic inequality, especially when the rights and needs of the poorest, most vulnerable sectors of society are so blatantly neglected. It is often a feature of living in extreme poverty that the most fundamental human rights to life, liberty and security of person are not guaranteed. The right to a standard of living adequate for the health and wellbeing of a person and their family is not a given. We may have no control over where or the circumstances into which we are born, but we at least deserve equal opportunities to basic rights and services, and the Mexican government has the responsibility to ensure these as well as security and dignity to its people. Mexico may be desperate to develop, but it must not do so at the cost of the poor and vulnerable. Let’s not forget that decisions about those living in poverty are overwhelmingly made by the rich, who may not always have the redistribution of wealth as a genuine concern. From hot cross buns and creme eggs at Easter to mince pies and mulled wine at Christmas, the anticipation of seasonal specialities makes them much more exciting than food and drink available at any time of the year. 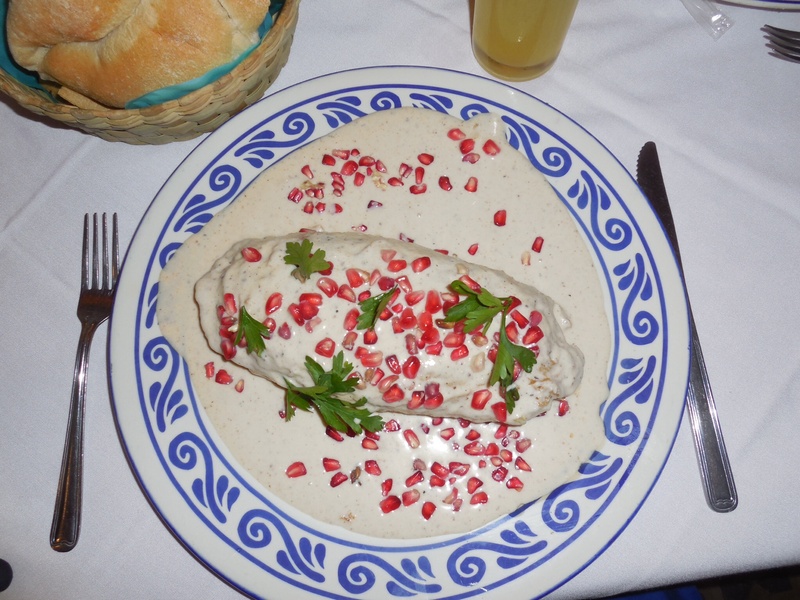 Puebla is home to a number of speciality dishes, many of which are available all year round, but the pièce de résistance (not only lauded as one of Puebla’s finest dishes but also Mexico’s) is the chile en nogada (meaning ‘chilli in walnut sauce’) – which is both weird and wonderful in equal measure. Puebla owes much of its culinary fame and prowess to the melding of traditional Mexican ingredients and cooking techniques with the arrival of Catholic nuns from Spain in the sixteenth century, who had the time and creativity to develop incredibly complicated and labour-intensive dishes. Owing to the limited seasonal availability of ingredients and the painstaking preparation processes, dishes such as chile en nogada are not meant to be eaten every day or in huge quantities but savoured and relished occasionally. The chile en nogada is a big, tasty, green chile poblano (a variety of chilli native to Puebla which looks more like a dark green pepper) filled with a picadillo mix of chopped meat and fruit and a variety of spices. The recipe, favourite ingredients, and chilli kick vary slightly, but every Poblano will tell you their grandma’s/auntie’s/cousin’s is the best! Typical ingredients include diced pork and beef, peach, pear, apple, raisins, almonds, pine nuts, onion, cinnamon, clove, thyme and oregano. The picadillo is slow-roasted for six to eight hours before being stuffed inside the chilli. Although not always served capeada, the original recipe dictates that it should be – a technique which requires a dunking in frothy egg batter and frying. Then comes the best bit – the heavenly walnut sauce – generously poured all over so that nothing can be seen underneath. This creamy white dressing creates the canvas for the presentation of the dish in the Mexican national colours: it is topped with a garnish of green parsley leaves and vibrant red juicy pomegranate seeds. The perfectly complementary red, white and green makes this dish as striking to the eye as it is to the palate. It is no coincidence that this unique dish is made with seasonal ingredients and presented in the national colours: its origin and serving are symbolic of Mexican independence. In August 1821 the Mexican military commander Agustín de Iturbide (who became the Emperor from 1822-3) signed the Treaty of Cordoba in Veracruz, which granted Mexico its independence. As he travelled from Veracruz inland to Mexico City he was scheduled to stop in Puebla, and the nuns of the convent of Santa Monica created this dish especially for his visit. Each year ‘the season’ of August and September sees the simultaneous recreation of this spectacular recipe and Independence Day preparation and celebrations; the markets are full of glistening pomegranates and all the local restaurants advertise that they are serving it. There is even a local festival hosted in which Pueblan kitchens compete to prepare the best-loved chile. Chile en nogada, served on a traditional Pueblan talavera plate. It provided my host family great amusement that in my first months here in Puebla my only trips to Cholula were made after dark. The nightlife in Puebla is tame to say the least, and there is much more going on in Cholula (just half an hour away) thanks to its large student population. After much nudging (which ranged from subtle hints to stern orders) I eventually made it to Cholula for a day trip, and understood immediately why it came so highly recommended. Cholula has a lovely small-town feel: it’s tranquil, colourful, and nestled deep in the Puebla-Tlaxcala valley surrounded by the volcanoes of the Central Mexican Highlands. It offers a completely different experience to so many of Mexico’s vast and sprawling colonial cities founded after the conquest, under the heavy hand of Spanish influence. Cholula is one of Mexico’s oldest settlements and home to centuries of pre-Hispanic history. From AD 1-600 it grew into an important (indigenous) religious centre, until it fell to the Olmeca Xicallanca. At some point between AD900 and 1300 the Toltecs and/or Chichimecs took over, and it later fell into Aztec dominance. When Cortés arrived with the Spanish he formed an allegiance with neighbouring Tlaxcala, and when the Aztecs in Cholula plotted to ambush Cortés the Tlaxcalans tipped him off and the Spanish had the upper hand. 6000 Cholulans were killed in a day and the city was looted ruthlessly by the Tlaxcalans. The Spanish founded the city of Puebla to overshadow the old pagan centre of Cholula, which was further devastated by a severe plague in the 1540s. These days it remains upstaged by the Catholic and colonial splendour of Puebla, but has developed its own alternative following: it is home to a generally younger, more fashionable population and hosts numerous trendy restaurants and bars. It also has a completely absurd number of churches in relation to its size. Thanks to its original indigenous population, Cholula is home to the widest pyramid ever built – Pirámide Tepanapa. What is more striking than the pyramid, however, is the church perched triumphantly atop – a powerful symbol of the merciless religious conquest that came with the arrival of the Spanish in Mexico. Although very little remains of the original pyramid structure, visitors can still explore the network of interior tunnels and see the excavated areas outside. Then it’s a short but steep climb up to the church, which offers spectacular views over the flat plains of Cholula. Two of Cholula’s most interesting churches are located in the neighbourhood of San Andrés. The first I visited, San Francisco Acatepec, was constructed between 1650 and 1750, the golden era of Mexican baroque and talavera. The immense wealth, exquisite design, and talented craftmanship of this period are flaunted in the façade of colourful tiles covering the front of the church, which really makes quite an impression. The interior is just as awe-inspiring, entirely encrusted from floor to ceiling in elaborate golden decoration. Unfortunately, the interior isn’t original, it was destroyed by a fire in 1939. But it was painstakingly reconstructed in 1941 thanks to photographs made before the fire which extensively documented the decoration – taken by no other than Guillermo Kahlo, Frida Kahlo’s father. At no time is the church more flamboyantly adorned than during the fiesta for San Francisco (the namesake of the church) which falls on the 4th of October. The most beautiful displays of fresh flowers covered every available surface, ready to wow the weekend’s worshippers. The church of Santa María Tonantzintla was also built in the seventeenth century, but is strikingly different. First of all, unlike Acatepec, it is relatively unassuming from the outside. It is far plainer, and has models of the Saints but with dark faces (like those of the indigenous Mexicans who created them). Whereas Acatepec presents itself as an extravagant show of Spanish wealth and style, Tonantzintla displays a far more complex union of Mexican and European culture and an interesting melding of Christian and indigenous world views. This includes the interpretation of both indigenous and Christian Gods and symbols, and the development of worship of Mother Nature to the Virgin Mother, Mary. The angels adorning the walls are not the blonde-haired, pale faced cherubs the European eye is accustomed to, but with dark skin and hair – those of Mexico’s Indians. Unlike the golden glow of Acatepec, the interior incorporates paintwork in a vast array of colours, and rather than smooth and pristine carvings, Tonantzintla’s are much more deeply etched and simplistically stylised in design. The church of Tonantzintla is autonomous from the Archdiocese of Puebla, and they do not allow photographs to be taken inside, but I have found a couple from Google which are shown below (all other photos are my own). Next up on our route was Huejotzingo, a small municipality in Puebla’s countryside. Here we visited the Franciscan monastery San Miguel Arcángel which was founded in 1525, making it one of the oldest monasteries in the Americas. It remains in very good condition, with original dining room and kitchen features, and etchings on the walls revealed beneath the more recent paintwork. The adjacent church (despite being mid-way through some repair work) was absolutely full of young teenagers having their first Holy Communion, and a wedding party waiting outside. The area is also known for its vast orchards and the production of apple cider – a sample of which was the perfect way to top off a long day of culture-seeking in the sun. It’s a hard life!